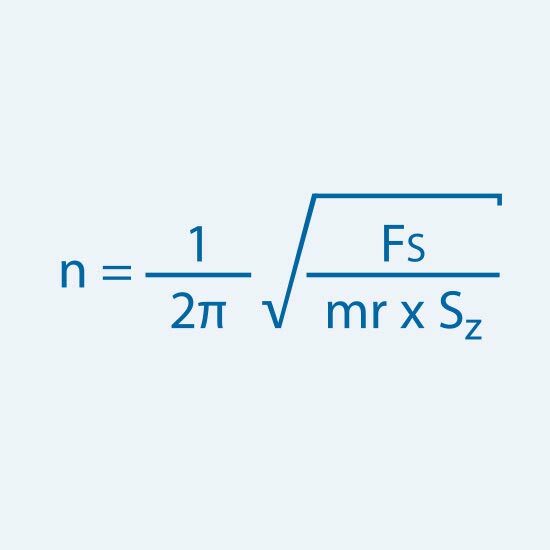 Theoretically, sprag type freewheel clutches have no speed limit during torque transfer. However, in idle and overrun operation, the influence of centrifugal forces must be considered. Spring tension produces a torque Fs, which uprights the sprags and maintains constant friction contact with the connecting parts. An opposing torque FZSZ (Fig. 1) is imposed by centrifugal force during rotation. When the lift-off torque becomes greater than the pressing torque (Fig. 2) created by the spring, the sprags will lift off the inner raceway. Reliable indexing is no longer possible under these conditions. The freewheel clutch insert elements inherent speed is the decisive factor for this. 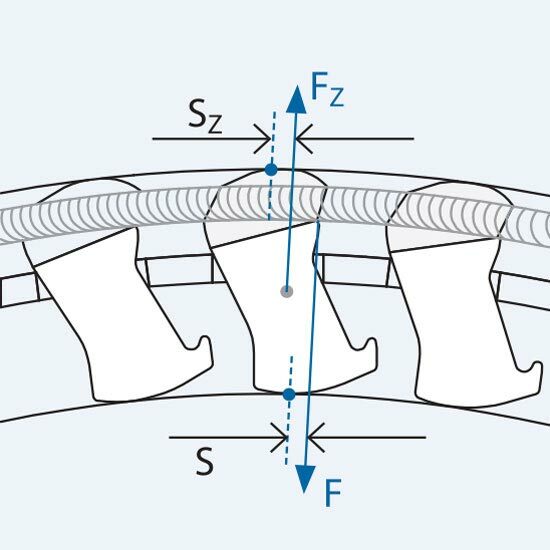 Inherent speed of the insert elements cannot be precisely determined in advance because the freewheel clutch’s insert element is only in friction contact (sliding friction) with the connecting parts. The freewheel clutch’s insert element will never rotate completely with the turning part, nor will it completely get stuck to the standing part; a differential speed will always be set. The rotary speed limits provided in the diagram and size tables describe the inherent speed of freewheel clutch insert elements, they do not describe the maximum rotary speed of the shaft or hub. These values serve as a means to estimate whether centrifugal influences might have an effect. For example, a critical operational state can be reached when the freewheel clutch is currently transferring torque and is then accelerated beyond the rotary speed limit. If the freewheel clutch is then disengaged, the sprags will lift off and lose contact with the raceway. A subsequent indexing process is only then possible if the rotary speed of the insert element is once more reduced to below the lift-off speed. The maximum permissible rotary speed of all sealed freewheel clutches is limited, not by centrifugal force, but rather by the friction and heat generated at the seal. In these cases, the rotary speed limit specified in the size tables is the maximum permissible difference speed of connecting parts. The sprag profile for our 8000 series is pressing, i.e. 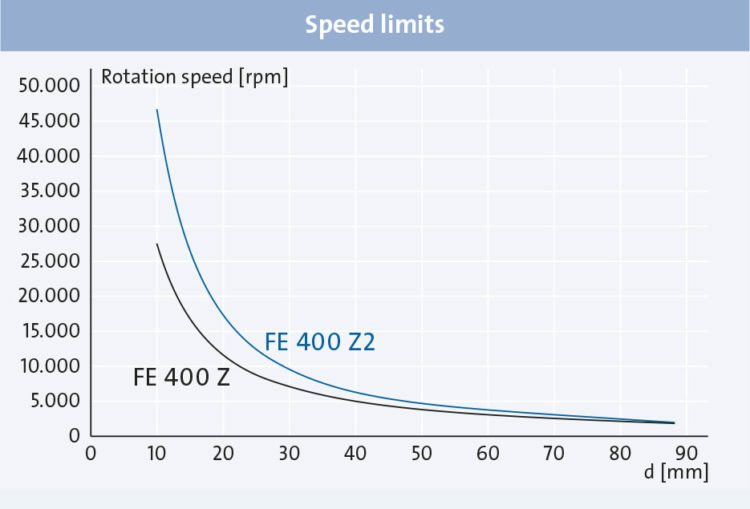 at high rotary speeds centrifugal force will produce a pressing torque on the sprag because of their altered center of inertia (in comparison to series 400 sprags). Series 8000 freewheel clutches therefore have no rotary speed limit.